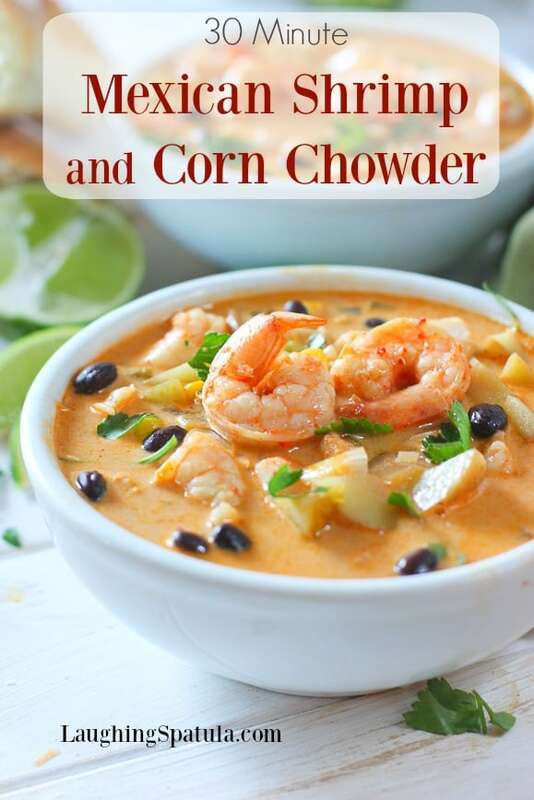 This Mexican Shrimp and Corn Chowder is my new favorite soup! The broth..oh that broth! Hard to believe it all comes together in about 30 minutes! We are crazy for soup around her! In fact when I started this blog it was going to be only soup, soup and more soup! After some thought and a craving for a burger I evolved, but soup is still always in my heart…. 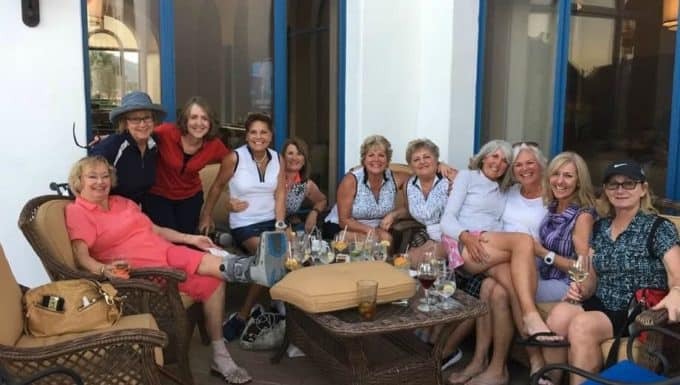 I recently played in a golf tournament in Palm Springs at the Citrus Club with my BFF Raela. Boy, that place knows how to throw a tourney! The theme was ‘Sumpin’ to Stew About’. At first I didn’t quite get it, but at each hole was a new stew or soup or stew recipe printed up for you to take home. How incredibly clever and fun! Not only that the recipes were fabulous! The purpose of my little golf story is that this recipe evolved from that tourney. I think I picked it up on hole #3 :). Should mention we took second place in our category. Oh, should also mention I had little to do with the win. My golf game makes me glad I can cook….ugh. Look at these beautiful ladies! Thats me and my BFF with matching shirts. We love matchy matchy, been doing it since we were 12! Time to make SOUP! YAY! 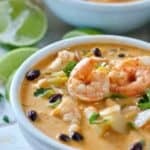 How to make Mexican Shrimp and Corn Chowder! So what makes this Mexican? Hey, good question! I would have to say it’s the poblano pepper, the black beans, cumin and chili spice. If you have never cooked with poblano’s, this is a great recipe to give them a try! I have almost stopped using green peppers all together. NOTE: Remove the seeds and veins inside and you are left with almost no heat and tons of flavor. The next step is to toss your shrimp in some great mexican spices. Chili powder, cumin and oregano. 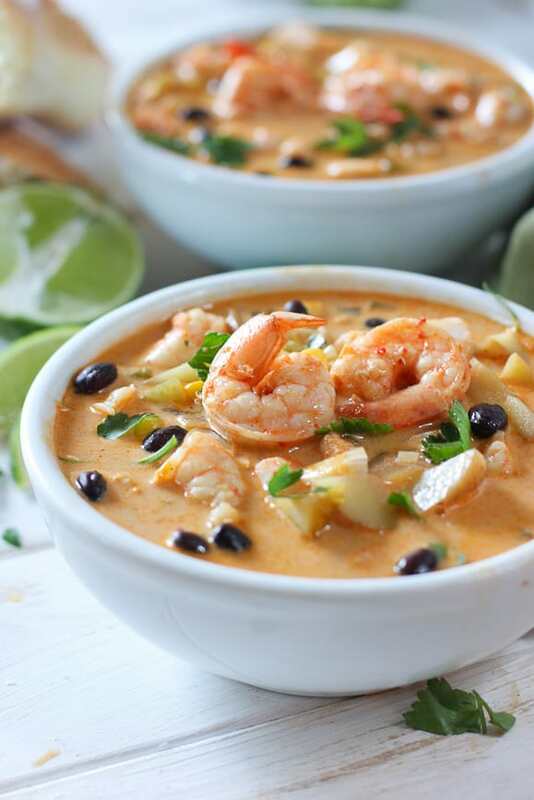 They create a great tasting shrimp broth to get your soup headed in the right flavor direction. Not a great pic but I wanted you stock see all that broth from the shrimp? Flavor lives there! Add your potatoes, broth and cream to the mixture and simmer until the potatoes are done. Toss the shrimp back in along with the corn and black beans. Taste taste taste for seasoning! Cumin and chili powder brands vary in strength. You can see all of our Fast, Fresh and Healthy Soup recipes HERE! Two of our faves are Chicken with Wild Rice and Chicken Pot Pie Soup. Both 30 minutes from start to finish! To soup, soup and more soup! A fabulous full flavored soup that comes together in 30 minutes! 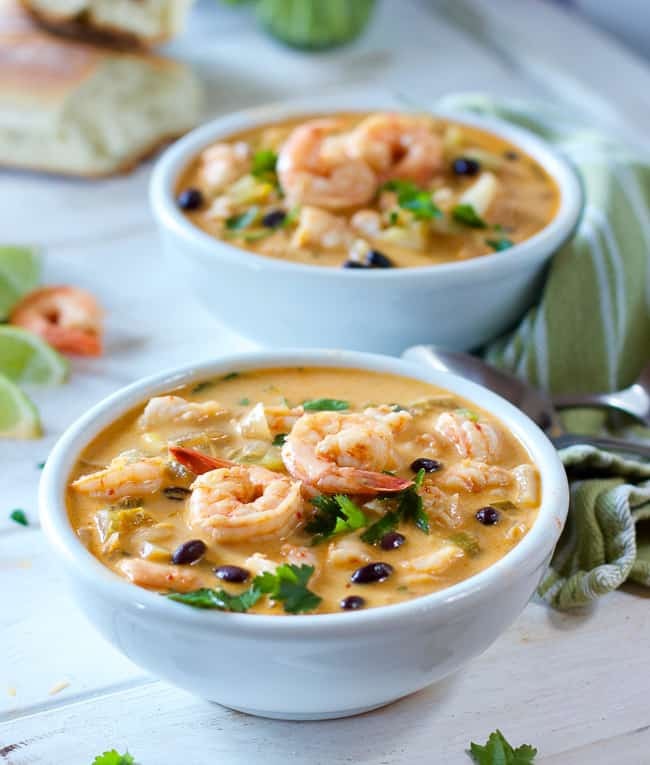 Shrimp, black beans, corn and a fat poblano pepper make this soup go zing without being to spicey. 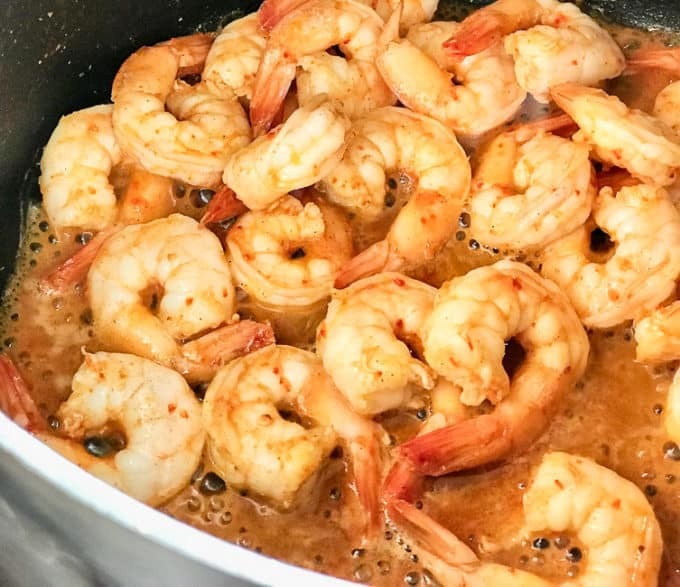 In medium bowl combine thawed shrimp, 2 teaspoons chili powder, 1 teaspoon cumin, 1/2 teaspoon dried oregano, 1/4 teaspoons salt and a pinch of ground black pepper. Heat large soup pot or dutch oven. Add 1 tablespoon olive oil. Pour shrimp and spice mixture into pot. Saute shrimp for 3-4 minutes or until just barely cooked and juices have released. Don't drain that shrimp juice! Remove shrimp to plate and set aside. Add chopped poblano, onion and celery to shrimp juice. Cook until veggies are soft. Add garlic and continue to cook for another 2 minutes. Season with salt and pepper. Add chicken stock, cream, diced potatoes and corn along with 1 teaspoon chili powder and 1 teaspoon cumin. Continue to cook until potatoes are fork tender. Add shrimp back to pot along with black beans. Heat through. TASTE! More salt? More pepper? Cumin or Chili Powder? Serve with a sprinkle of Cochita or Feta cheese! This is the most delicious chowder I have ever eaten, let alone prepared. I woke up in the night thinking about it and had to force myself not to get up and eat the leftovers in the middle of the night, like a total creep. My lazy-slash-waste-saving alterations: used one whole can of black beans, one whole can of sweet corn, the full cup of the whipping cream I bought. It’s my fave too Patty! It’s worth a midnight trip to the fridge! Thanks so much for your nice note! You can never go wrong with shrimp . . . in anything! Love those Tex-Mex flavours. Congrats on your golf tourney! Weren’t you smart to head south and avoid this wet and chilly PNW winter! Pinning this to make soon. Chasing the sunshine is a full time job in the PNW! Thank you for the note Elaine! So easy and looks amazing! Saving this for later! Thanks Karly! Hope you get a chance to give it a try!